I had an idea the other day for a new line of beverages that will most certainly own it’s fair slice of the market pie in years to come. The beverages which will make fun of some of the more popular drinks on the market, never by name but by concept, will all use puns to get across the product function. The first product launched in a long line of memorable and profitable drinks will be called Vani-TEA. 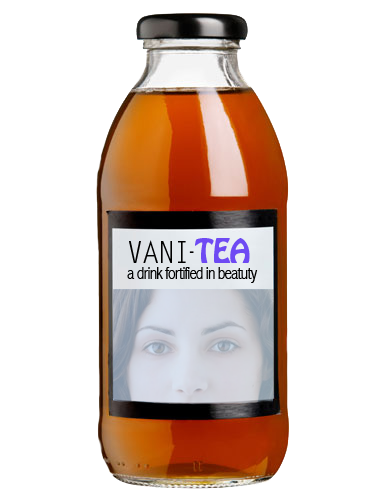 Vani-TEA will be an iced tea beverage that contains all the essential fortifications that support healthier skin (vitamins A, C, E, and B). And the packaging will include one side of the squared bottle that has a reflective material, so that drinkers can bask in all of their vanity. Drink will be available 2020, in all KOG stores.